Here is better than a play like Black a. After both black groups have a base so that Black can fight strongly when White invades. Black at a prevents White from making a really easy invasion: but it seems to do less that is definite and Black doesn't yet have much territory. John Fairbairn: Don't you think the proverb play away from thickness covers it? And if we apply principles as opposed to personal style, wouldn't be better on the fourth line? If so, "balance" is an applicable principle. I can see also a case for the principle of inviting the opponent to invade your framework (a would not be a framework). Charles: More about maintaining some other sort of balance than about any kind of thickness, really. BobMcGuigan: conforms to the principle of strengthening the weaker stone when extending. A play at a instead would be over-concentrated relative to the corner. It would also allow a good white invasion below the star point on the upper side. After the invading stone becomes stronger there could be aji against the black corner as well. Bill: Black is already overconcentrated in the top left corner. At first I thought there was a small low enclosure there, but it is a strange one space extension from the 3-3. Was there an original typo in the diagram? Charles: No, the 3353 enclosure was intentional. Just to make the point about frameworks with two 'strong ends' stand out a little more. Charles: The other side of the story would be this. After , White can make something of a base: this is a relatively easy invasion. If had been further to the left then wouldn't work so well. But the point would be that Black's upper side group looks quite settled at present: Black should have time to play a flanking extension at a point like a.
I'd also argue that this sequence available to White is a good reason not to play at b, instead. Bill: After the pincer is better, I think. There are several variations, OC, but in the ones I looked at, I think that works out fine. Charles: Yes, that does look strong. So in this case might be close to an overplay. Charles: Here's a similar example, related to what was said at 3-3 point with 4-4 point. This is an uncommon side pattern. The reason would be that the enclosure with BC would normally take a lower priority amongst big points in the opening. 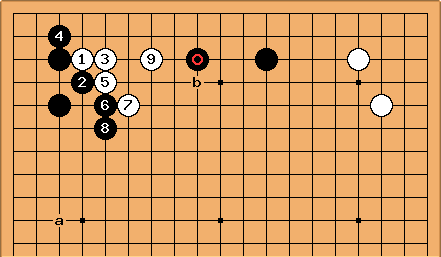 It was played in relation with black strength in the lower right. On one occasion (Sugiuchi Kazuko-Kataoka Satoshi(B) 1988-07-05, colours reversed) this did occur. Black played simply to settle with the standard joseki. This therefore does give two strong ends, and a five-space extension between them, for an efficient formation.